This heavy low slung breed was one of the first breeds recognized by the AKC. The Sussex Spaniel has a deep chest and loose skin as well as pendent ears and feathered tail and legs. Sussex Spaniels are covered in soft wavy hair. The Sussex Spaniel originated in England. Sussex Spaniels are golden-liver colored. 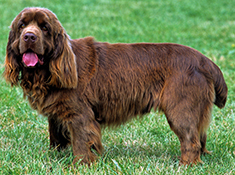 The Sussex Spaniel's thick flat coat has a weatherproof undercoat which requires regular brushing. The ears and pads of the feet must be checked and cleaned regularly. This breed is an average shedder. Slow and easy going, the Sussex Spaniel is very fond of its family. Placid and friendly, this breed is a keen and determined worker but not very outgoing. It is a talented hunting companion though it may not move as quickly as other spaniels. Sussex Spaniels love everyone and may howl if left alone for a long time. Sussex Spaniels are barkers and howlers. The Sussex Spaniel is prone to heart problems, joint problems, ear infections, intervertebral disc syndrome, otitis exerna, entropion in the eyelids, and infections in the droopy lower eyelids. The Sussex Spaniel can be expected to live about 12 t 15 years. Sussex Spaniels require ample exercise and love to swim and retrieve. This dog breed can live outdoors in temperate climates but does better living indoors. The Sussex Spaniel is in the Sporting Group. After an exciting Best-in-Show win at the 2009 Westminster Kennel Club dog show, the popularity of the Sussex is beginning to grow. Although the Sussex is one of the oldest breeds recognized by the American Kennel Club, it is also one of the rarest, ranking 147th out of 161 recognized breeds. In the estates of Sussex County, England, the Sussex Spaniel was bred in the late 19th Century for its strength, maneuverability, and prey drive, all valuable assets for a dog used in hunting. Imported to the United States, the breed was one of the original ten admitted to the Stud Book when the American Kennel Club was founded in 1884. Purebred Sussex Spaniels were registered with the AKC sporadically throughout the first half of the 20th Century, but American-born litters were few and far between. The breed all but died out in America in the late 1950’s, but was revived in the 1970’s through the efforts of three kennel owners. All American-born Sussex Spaniels today are descendants of dogs imported from England by Ziyadah Kennels, Wilred Kennels, and Lexxfield Kennels, run by George and Marcia Deugan, William and Margaret Reid, and John Robert Lewis, Jr., respectively. The Sussex still looks much as he did when he was first developed in England. The characteristic short legs and long body, plus the long, silky chestnut-colored fur form the basis of the breed standard. The Sussex is the stockiest of all Spaniel breeds, originally using his powerful muscular body to flush out game from the underbrush. The hazel-colored eyes are somewhat droopy, while the large ears hang down to jaw-level. The heavily jowled mouth is prone to some drooling as well as sloppy eating and drinking. The fur color is officially called liver, although the tips of the fur turn golden, particularly when exposed to a lot of sun. The slightly wavy coat does not get excessively long except on the ears, and very little grooming is needed. The Sussex can shed heavily; regular brushing can help to keep at least some of the fur off of the furniture. The tail is generally docked, but remains longer than that of a Cocker Spaniel. The average Sussex Spaniel weighs between 35 and 45 pounds and stands no more than 16 inches tall at the shoulders. Interestingly, the forelegs are rather short while the hind legs are a bit longer. It is not uncommon for dogs of this breed to walk only on their front legs, dragging their hind legs stretched out behind them in a gait known as kippering. How does the Sussex Spaniel act? These dogs have a very sweet temperament, but they are known for being stubborn. They get along well with children and other pets, and are very loyal to their families. Of all the Spaniel breeds, the Sussex makes the best watchdog, as he can become ferocious when he senses a threat. Indoors when the family is around, the Sussex is calm, becoming almost as much of a doorstop as the Bassett Hound. However, outdoors, the Sussex comes alive, romping, baying, howling, and barking his joy at being out in the fresh air. He tends to stick close to his owner, sometimes being described as clingy. One major drawback to this breed is that the Sussex is often prone to separation anxiety. He can be very destructive and very loud if left alone for long periods of time. He needs both the mental stimulation and physical activity that come from human companionship. If you work long hours, you would have to make arrangements for someone to take care of your Sussex during the day. Left alone, he will chew, claw, and otherwise destroy all of your possessions, and your neighbors will likely complain about all of the barking and howling. What health problems are common in Sussex Spaniels? The average life span of the Sussex is 11 – 15 years. Given that all modern Sussex Spaniels derive from three breeding pairs, it is amazing that there are not major genetic problems in the breed. However, there are a few diseases to which the breed is prone. Hip dysplasia is common, and prospective puppy-buyers should ask to see OFA certifications of the parents of all puppies. Because the Sussex is smaller than most dogs who suffer from hip dysplasia, the disease is not as debilitating for them as it is in some other breeds. The Sussex often has excessive tartar build-up on his teeth, and preventive dental care is required to allow the dog to keep his teeth. Caesarian sections are often required as females may have trouble whelping their pups. The dog’s large ears are subject to infection as the ear flap traps moisture and the long fur is likely to pick up burrs and ticks. Eye problems plague this breed, and the eyes should be checked regularly for irregularities. Cataracts, entropion (an eyelid that is turned inwards, causing the lashes to scratch against the eye), and retinal dysplasia can all result in blindness. Because these dogs are stocky to begin with, obesity can quickly become a problem. Diet must be carefully regulated, and regular exercise is imperative to keep the Sussex Spaniel in shape. However, the most serious of the health problems common to Sussex Spaniels are related to the heart. Pulmonic stenosis occurs when the pulmonary valve is narrowed, slowing the blood flow between the heart and lungs. Patent ductus arteriousus results when the opening between the aorta and pulmonary artery doesn’t fuse closed soon after birth as it is supposed to. Finally, Tetralogy of Fallot is a cluster of heart malformations: a hole between the heart ventricles, pulmonary stenosis, misplacement of the aorta, and a thickening of the wall in the right ventricle. All of these cardiac problems can be treated surgically, but are quite expensive. Unless the dog is expected to show well enough to generate extensive stud fees, many guardians are forced to put their dogs down rather than bear the overwhelming cost of cardiac care. Is this the dog for you? Although difficult to find in the United States, this friendly Spaniel can make a great family pet as long as his guardian is willing and able to provide adequate exercise and companionship for the dog. Find Sussex Spaniel Puppies with our Free Breeder search!